“It’s a real honour to be able to bring the extraordinary world of The Small Faces back to the fans and to a brand new audience, young and old. 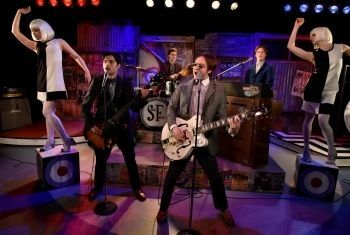 Audiences have embraced the chance to enjoy a bit of mod nostalgia and the critics have all acknowledged the vivid underground vibe on stage as we bring the 60s scene into sharp focus. Our live band and cast tell the story of the rise and fall of the band, a journey as colourful as their sound, and get to showcase an amazing catalogue of music - hard edged R&B. This is music which influenced a generation of musicians from Paul Weller and The Jam to Oasis, Blur, The Verve and The Arctic Monkeys, not to mention millions of fans. We’ve found an amazingly loyal fan base and are thrilled to be bringing the show back across England, into Wales and into Scotland for the first time. Book now – it’s truly an experience of a lifetime!" Chris Simmons is probably best known for playing the role of DC Mickey Webb for over twelve years in the long running ITV series The Bill. He has also appeared in EastEnders as Mark Garland, a love interest for Kat Moon and in the Tracy Beaker spin-off CBBC show, The Dumping Ground. Russell Floyd first came to public attention as market inspector Michael Rose in EastEnders a role he played from 1996 to 1999, and subsequently played DC Ken Drummond in the ITV police drama, The Bill, from 2002 to 2005. He also starred in Jonathan Ford’s 2016 movie Offensive.